In early December 2013 I read a report in the Globe and Mail by Geoffrey York (“A Desperate and deadly tide of migration,” p. A17, December 4, 2013) about the human trafficking of Eritreans in the Sinai Peninsula area of Egypt, next to Israel. York in turn was reporting on a document submitted to the European parliament by three researchers, an Eritrean human rights activist called Meron Estefanos, and Professor Mirjan van Risen and Dr. Connie Rijken from Tilburg University in the Netherlands. The report is called “The Human Trafficking Cycle: Sinai and Beyond” and can be found here http://www.eepa.be/wcm/dmdocuments/Small_HumanTrafficking-Sinai2-web-3.pdf. These unfortunate Eritreans are captured or purchased by human traffickers, who torture them and threaten them with amputations or sale of their organs if they do not manage to raise ransoms from their families to free them. Sometimes the kidnappers telephone family members to listen as their loved ones are tortured. The Eritrean families have to raise thousands of dollars to ransom them: how they get the money I do not know, given how poor Eritrea is. 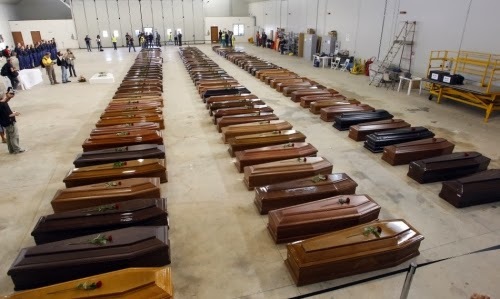 This is part of a larger story of Eritrean refugees, several hundred of whom drowned in 2013 while trying to reach the Italian island of Lampedusa just north of Tunisia. By state slavery, I mean states—governments in power—who enslave their own citizens. One kind of state slavery is the communist kind, which in the 20th century enslaved large numbers of people in prison camps now collectively known as the gulag, originally an acronym for slave-labor camps in the Soviet Union. Such enslavement was also widely used in China after 1949 and is still practiced, although apparently China’s rulers recently decided to abolish it. Slave labor was also practiced on an enormous scale during the genocidal regime of the Khmer Rouge in Cambodia (1975-79). The second kind of state slavery is enslavement of citizens for the financial or material benefit of the government and the individual slavers who control it, and that is the kind you find in Eritrea. Eritrea is a small state on the east coast of Africa that obtained its independence from Ethiopia in 1993 after a long civil war. During the war, as I recall, there was a lot of propaganda about how the Eritrean nationalists were democrats who deserved to be freed from the tyrannical regime of Mengistu Haile Mariam in Ethiopia. Yet the Eritrean rulers soon introduced a system of state slavery for the benefit of the government and those who controlled it. They instituted an 18-month period of obligatory military service for every adult, male or female. By 1998 they had extended this so-called military service to be indefinite forced labor of anyone unfortunate enough to be drafted into the army. Officially, this forced labor lasts until the age of fifty, but sometimes individuals are enslaved even longer. Members of government and the ruling party, and senior military officers, use these slaves to build their houses, act as their personal servants, and work on farms, building sites, and enterprises owned by the state or army. Knowing what I did about Eritrea, I assumed the unfortunate victims of these traffickers in northern Africa were refugees who had fallen into the wrong hands. But it turns out that sometimes they are kidnapped by their own Eritrean security officials, who sell them to Sudanese traffickers, including military officials and border guards, who then sell them on to traffickers in the Sinai. It isn’t enough for Eritrean officials to run a state of internal slavery, it seems; they also engage in the slave trade. Another shocking aspect of this story is the way Eritreans are treated when they finally escape their captors. Some manage to reach the Israeli border, but the Israelis simply turn them back when they try to enter. Israel ratified the United Nations Convention on Refugees in 1954. One aspect of that convention is the provision of non-refoulement. Non-refoulement means you can’t return an individual to a country where she is likely to be tortured or politically persecuted. Yet the Israelis don’t offer to help these refugees: they simply return them to the very Egyptian soldiers who have often colluded in their capture in the first place. These soldiers often hold them to ransom again, before they can return to Eritrea. Israel should be ashamed of itself, but apparently it has a hard time accepting that the black African people who live close to them have the same moral right to assistance as the Jews who were denied entrance to Canada, the United States, and other countries during Nazi rule in Europe. If you are Eritrean, it seems, your choice—so-called--is between the devil you know and the devil you don’t know. If you stay in Eritrea, you may well be a slave. If you leave, you risk drowning, kidnapping, torture and murder. Meantime we are all horrified when hundreds drown within sight of Europe, but we manage to ignore what drove these hapless people out of their own country.